The baby was so tiny, nestled in the front-pack against its mother’s chest; only the back of its little head covered in long strands of dark hair stuck out for us to see. “How old do you think that baby is?” Cam asked. We were in the Detroit Airport a week ago Sunday, making our way home from our niece’s wedding in Virginia, and preparing to board the evening flight north to Marquette. The young mother stood over by the door to our plane’s gateway next to a Delta employee who was helping her with a stroller and what seemed like a multitude of bags. “Not more than four weeks,” I replied as we made our way closer to her. Seconds later, Cam and I, carrying the diaper bag and some kind of a blue cooler filled with baby things, discovered that I’d been way off in my guess of the infants’ age. “He’s six days old,” the mother said, hospital bracelet still wrapped around her wrist. “And we’re going home,” she added as we followed her down the jet-way and onto our plane. I didn’t get to hear the rest of her story. Why was she flying with a newborn? And where had she been? And why wasn’t a family member with her on this flight? Questions were reeling through my mind as we watched our new friends, mother and teeny-tiny baby in his kangaroo-like pouch, gingerly sit down in Row 2. From Row 8, where we were now buckled in, we lost our view of her. But I can tell you this . . . every person, every single person who walked on that plane, glanced over at that little newborn baby boy and his young mother and they sighed and they oohed and they ahhed, and there was a hush in the air, even as the flight attendant, who was also oohing and aahing, prepared the cabin for take-off. It’s different with a newborn. With a three month old, you smile at the baby and you smile at the mother, and you offer to help if it seems like her hands are full. With a six month old, you smile even more broadly until you are rewarded with that wide Gerber Baby snaggle-tooth grin. With a nine month old, you clap your hands, and you hide your head and you pop up and poke your head over the plane’s seat in front of you, peek-a-boo!!!!!! You play games with a nine month old, but not with a newborn. With a newborn, you sit still in holy reverence, and you envision an extra blanket of safety around your plane, and you feel your heart breaking open with the knowing that this plane, the one that you are now on, is carrying a new life north to the place that he will call home. We’re in spring-winter. This past Saturday, three days after the equinox, I skate-skied on a wide perfectly-groomed trail up into the hills and snow-covered woods. It was mid-winter skiing at its finest on a day in late March, and the signs of spring were few: the twitter of a flock of songbirds; squirrel tracks, maybe more than you’d see in January; a strip of sapphire blue Lake Superior, thawed-out and beckoning me back down the hills again hours later; a brighter sky than expected as I skid to a stop at the trailhead in the early evening. It was a wonderful four-hour ski and I was alone on the trail with all that snow and the crisp fresh air and my own spring-winter thoughts. My mind flew this way and that way with the flurries of snow. I thought of the book that I’m writing, that is on the home stretch, ready for a fine-tooth editing and a table of contents and a page of acknowledgements, the book that I’ve shared thus far with very few people, that I’m still keeping tucked close to my chest. I thought of other projects, too, ones that still are seeds of possibility, not quite born — and I wondered as I skied, what could possibly replace this heart-pumping, full-bodied skate-skiing fun when the snow finally does melt. It’s an okay place to be, a good place to be, in spring-winter. Soon enough the days will heat up and the banks will shrink away and the streams of melting snow will run down the streets and we will be running, too, on sloppy trails of red iron-ore mud. And our projects, the ones that are just seeds, will start to take root and we will be planting our gardens and brightening our walls and scrawling our pens across new pages, and we will be bringing our babies, the ones that right now we are holding close to our hearts, out into the warm spring air. It the meantime, let’s enjoy spring-winter, this in-between season, where dreams can still be cuddled and coddled. When the plane landed a week ago Sunday in the clear cold of Marquette County, it was the pilot himself who was first off the plane, and he was carrying a diaper bag and a blue cooler of baby things and he was escorting this young mother and the newborn baby boy nestled against her out through the jet-way and into this northern season of tender beginnings. I was half-listening to a live-stream seminar while washing dishes a week or so ago, when I heard the words that caught my attention. Dropping the dishcloth and putting down the half-dried skillet, I honed in closer to my computer and the Law of Attraction Workshop in progess. “Go for alignment first. Alignment trumps technique every time. In fact, sometimes technique can squeeze the life right out of an action.” I was delighted to hear this response to a voice teacher’s question about alignment and technique – not only because it was related to the topic of music and I love to sing, and do so with gusto sometimes when I’m feeling free, though even I can hear that I don’t carry the tune where others do and I’m lacking miles in the technique department, but also I was delighted because in my heart I know it to be true. I know it in my writing. I’m appreciative of the technical skills that I have acquired through years of schooling and experience, and, yet, there is nothing quite so fun, so freeing as letting it all go and allowing the pen fly. I do this every month when I gather with the women in my writing group. We’re an informal bunch, and we keep our format easy and loose. We jot down topics that float into our heads, give ourselves a time period, perhaps an hour or so, and then we are off and running or should I say writing; we’re letting it rip. With purple pen in hand, and an unlined notebook, I find a comfy spot and I begin – I let the words pour out onto the page. Mrs. Lichness, my first grade teacher, isn’t hovering over my shoulder, isn’t poking my left hand into the correct position, as it forms great sweeping non-perfect letters and words and sentences and paragraphs across the white surface. Or maybe my left hand isn’t forming paragraphs at all because who needs paragraphs when the grammar police are nowhere to be found. I let technique go and I write and I write and I write, and it’s not the words that matter as much as the energy behind the words. It’s the feel-good place that I’m seeking, the place where heart and hand and mind and thought all come together; it’s the place of alignment. And sometimes it’s a sluggish start and it feels like gibberish that is making its way onto the page – or at least the English major part of me thinks it’s gibberish. I try to ignore that inner English major and I keep on going, sometimes focusing on a single topic, sometimes skimming and skipping from one topic to the next, until I feel it, that something that begins to happen, a rush of the feel-good, a heart connection to what I’m writing. And sometimes a story appears, or the start of one, or a poem rises up, or I find a hidden gem. And this is just dessert at the end of a good meal. Because it’s the feel-good meal that I’m going for, in the writing and in the reading. And that’s what we do next; we read what we have written. We suspend judgment, forget about technique and listen to each other as we share something tender and new that has risen up from our depths. Technique can make an appearance later with its commas and semi-colons and separate paragraphs, but for the moment, it is the fresh and the raw and the real. I like to imagine that this meal served to me on the shores of the sea was prepared from a place of alignment, that the fisherman casting his nets that morning felt the softness of the breeze and smiled into the rising sun, that the chef who was chopping the tomatoes and basil felt the warmth of their ripeness, that a song was wafting through the air as the pasta was coming to a boil, that it was all placed on this plate with a lightness and an ease and a heart-felt touch. It certainly tasted that way. I’m appreciative of technique. A charred fish loses its sweetness. Over-cooked pasta turns into mush. A purple-penned scrawl of timed-writing might not make sense in a blog to post. And I know, from the depths of my being, that technique without heart, without a sense of alignment, is flimsy and dry and perhaps overcooked. I’ll take the taste of alignment every time!!!!! When I walked through the entryway of my home in the wee hours of Monday morning a week ago after a delayed return flight, I was surprised by the intensity of color, the boldness of the bouquet of tulips sitting in their pottery vase on the hall table, the lushness of the gabbeh rug at my feet, the walls painted in rich hues of sunshine gold, Mediterranean blue and baked clay. Everything seemed brighter, more alive than when I had walked out that same door the previous Tuesday morning to fly west to Laramie, Wyoming for a visit with my son, daughter-in-law and Baby Viren. Something had shifted for me on the high plains of Laramie during this six days of open sky and intimate family time. It’s always a joy to visit with my kids, always fun to explore a place that I’m just getting to know, and . . . and it is icing on the cake, delicious lick-with-your-fingers-frosting, a sugar-high extra-ordinaire to allow an-almost-eight-month-old wide-eyed happy baby boy to lead you around. And that’s what happened; Viren led me around. Each morning, while his parents, who, day after day, are up before dawn with this robust little guy, snuck back to bed for some much-appreciated sleep, Viren and I played. On forearms and lower legs, with head swinging side to side, Viren scooted across the floor, from living room through kitchen and dining area down the short hall to a bedroom that is a treasure chest of toys and stuffed animals. And I, his loving grandma, on hands and knees, followed. We stopped in doorways, touched the brass hinges, swung the doors open and shut. We grabbed at stuffed monkeys, rubbed our hands across their faux-fur hides, hugged them tight and squealed into their faces, and one of us, the smaller and more-wide-eyed, shoved a monkey’s paws and nose right into his open and eager mouth. And when I scooped up this bundle of enthusiastic baby, propped him on my hip and started the journey back to living room, he squealed, each time he squealed, as we passed the collage on the hallway wall of photos of his-truly. He loves looking at himself. He loves pointing to these photos of eyes and nose and mouth. He loves crawling back over to them again and again, and pulling himself up on the wall, and calling out for a lift. 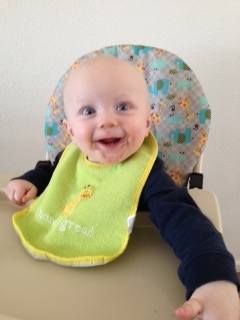 He loves shrieking as his grandmother obliges, as once again he’s face to face with his own wide-eyed and smiling self. Viren’s exuberance is contagious. Those early morning sessions woke me up. I felt as though I was buzzing inside, as though I, too, was wide-eyed and smiling at my own smiling self. It was on Friday, three full days into the visit, that I soaked in an even larger dose of Viren-enthusiasm. Shelly had some work to do in Boulder, so we piled into the car, Shel in the front, Viren and I in the back, and we headed south to our old stomping ground in Colorado. And for the four hours that Shel navigated through her work day, Grandma and Viren navigated the streets and walkways of Boulder. It was Grandma and Viren’s big day out; we were on our own, and, we were up to the task. The highlights were many: a pirate’s hat for Viren at Grandma’s favorite yoga clothing store, lunch on a park bench in the warm forty-five degree sun, a laughing fit in the pet food aisle of Alfalfa’s as we both sipped Grandma’s ginger-lemon fresh-squeezed green juice and made funny pucker-faces as the juice slid down our throats. Although I know how to be silly, this bout of unrestrained giggles was freeing. It was noon and the lunchtime crowd was on a mission as they lined up at the juice counter and deli, serious in their intent, not in the mood to gurgle and coo and squeal with delight. And I get it. How many times have I been on a mission, plowing forward, forgetting that “silly” is one of the highest of vibes ? We were still laughing when we headed out to the parking lot, still buzzing with the thrill of puckery juice and a belly-giggle when we, Grandma pushing Viren in his big-wheeled stroller, made our way across the street to the park by the creek. And that’s when we saw the ducks, the multitude of mallards climbing up the river’s bank, waddling and quacking and heading in our direction. It was one of those moments when your eyes widen and you are present in the present with your wide-eyed grandson, seeing the world through his eyes as the stuffed animals suddenly come to life and start approaching your out-stretched arms, one of those moments wrapped in present-day wonder in which you are also remembering the past, how his father, your son, at the same age, in another college town, on the banks of another river, also loved to play with these living breathing quacking creatures, how then, too, you saw the world with a wonder that was fresh and new and vividly alive. And somewhere on that Boulder Creek Path, as I pushed the stroller along its banks, it was my father who came to me, how, when I was a girl, he told me the story over and over again, of the August day at church camp in Fryburg, Maine, the day that my mother was bedridden with the flu and he took over, how he placed me, a seven month old, in the backpack and walked the two miles into town, how he bought an ice cream cone and we both shared a lick, how I cooed and gurgled and smiled at the people passing by. I sense that it was a big deal, that it wasn’t something that he did often. I sense that, like me, he was relieved that all went well, that he returned to the mother a happy baby. And I sense something else, that my father, who walked with a musical gait and wore sunshine on his face, smiled a little broader on that day. I sense that he carried this wide-eyed enthusiasm forward with him and reminded himself of it each time that he told the story. I intend to do the same.